After the trailer was shown, Filoni, Marshall, and Gray received a standing ovation from the crowd in Toronto. They proceeded to announce that the season would premiere on October 16th on Disney XD. Then, as a special treat for the fans in attendance, the two part season premiere, "Heroes of Mandalore," was screened. 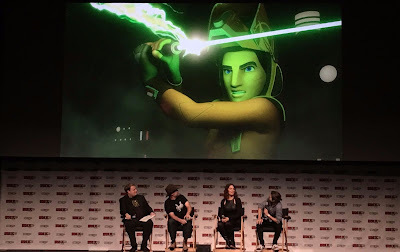 The first part of "Heroes of Mandalore" had previously been shown at Star Wars Celebration in Orlando back in April, but the second episode wasn't ready at the time. Both episodes are now finished and look great! I'll have more to say about the Rebels season four premiere later this weekend when I write up my full, spoiler free review. For now, I'll just say this: "Heroes of Mandalore" may be the best Star Wars Rebels season premiere (and that includes "Spark of Rebellion"). It features a perfect mix of classic Star Wars action and emotional character moments. It will make you laugh, cheer, and cry. The audience in Toronto loved it, with many moments of cheering and applause (and another standing ovation when the episode finished). Big thanks to Dave Filoni, Taylor Gray, Vanessa Marshall, and everyone at Lucasfilm and Fan Expo who made this panel happen. Hopefully this is just the first of many Star Wars preview panels at Fan Expo! Make sure to follow @TheSWU on Instagram and Twitter for more updates from Fan Expo Canada throughout the weekend!